A TRILOGY FOR XMAS (CHRISTMAS) Nothing is ever normal at 19 Nocturne Boulevard. So when Olivia ,decides to read a few of her favorite Xmas tales, things get a bit out of hand. Adapted from tales by Arnold Bennett, Rudyard Kipling, and Joseph Conrad. 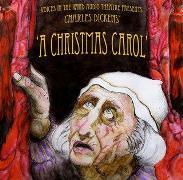 Featuring virtuoso performances from the entire cast, riveting sound effects and original music, VOICES IN THE WIND AUDIO THEATRE'S production ofA CHRISTMAS CAROL is an adventure in sound and imagination.